Six years ago, some of Victoria Ruiz’s friends and her mother flew from San Jose, California to Providence, Rhode Island to watch her perform as frontwoman of the punk band Downtown Boys for the first time. Ruiz was overwhelmed. She had performed in musical theatre before as a child, but this was different. During the first song, Ruiz—who is asthmatic—had trouble breathing; she didn’t know how to manage her energy or vocal chords. She made it through the show with a throbbing headache—but despite the discomfort, she still felt like she belonged onstage. Little did she know that, thanks in part to her stage presence and her commitment to making music for the downtrodden, Downtown Boys would quickly become one of the most important voices redefining punk rock. Today, Downtown Boys’ euphoric, saxophone-fueled shows feel therapeutic for Latinx fans and anyone who may belong to a marginalized group. Ruiz takes on a role that emulates a preacher, spreading the gospel of the importance of acceptance, respect, love, and tolerance. It’s powerful to see a Latina take command of the room, to see the audience members stand in awe and react to the message that Ruiz goes to great pains to deliver: that we have to start paying attention to the issues facing our society today. Ruiz’s speeches have now become a staple at the band’s shows, although they weren’t originally meant to be a permanent part of performances. Ruiz started doing them when the band played basement shows and didn’t necessarily have access to the best sound systems. Shouting into the microphone, she would tell the crowd what the songs were about in case they couldn’t hear or understand the lyrics. The band, which is mostly made up of Latinx members (with the exception of guitarist Joey La Neve DeFrancesco and saxophonist Joe DeGeorge), expressed their disappointment with the review in a Facebook post, noting that the lyrics are easily accessible and that the writer could have figured out what the song is about if he tried. Since then, Pitchfork has improved the way their critics discuss Downtown Boys’ music, but the disconnect between white writers and Spanish lyrics shows just how much the band has fought to be respected and listened to. “Monstro” is now one of their most popular songs; it’s an anthem for defying discrimination and celebrating being a woman of color. In other words, their work is paying off. On their new album, Cost of Living, the band’s first for Sub Pop, Downtown Boys bring yet another feminist anthem for Latinas on the track “Somos Chulas (No Somos Pendejas)”. At SXSW this year, whenever Ruiz performed the song, often to an audience filled with Chicanas and Latinas just like her, I noticed how important this representation was. Pendeja, a feminine noun for “idiot,” is a word that carries a lot of weight for Latinas. It’s one my mother says when she reminds me that I should never let anyone take advantage of me, especially when it comes to my career: “No seas pendeja.” A pendeja is someone who lets people walk over her, use her to their advantage, and end up with nothing. In the context of the song, it’s used as a way of showing that Latinas who don’t fit the superficial, white-washed mold are still valuable and “chulas” (Spanish for cute). They are worthy of attention and admiration. Hearing Ruiz shout these words—and eventually, singing them onstage with her and the band—was one of the most empowering things I’ve experienced. When Ruiz later moved to Providence, she worked in the same hotel as DeFrancesco, where they unionized with other workers for better working conditions. At that time, DeFrancesco was in a marching band called What Cheer? Brigade along with Norlan Olivo, the current drummer in Downtown Boys. The day DeFrancesco decided to quit his job in 2011, he posted a viral video titled “Joey Quits,” in which he confronts his boss and dramatically walks out with his band in tow, playing celebratory music. Ruiz, who at the time did not play music, is shown standing with the band, shouting “Joey quits! Joey quits!” Shortly after that, DeFrancesco asked Ruiz to start a band with him, which later expanded to add Olivo, Mary Regalado, and Joe DeGeorge. The concept of political awareness is particularly important to Downtown Boys, who use their music to touch on a variety of issues, including sexism, racism, socio-economic concerns, and homophobia. But today their words feel more timely than ever. In August, a white nationalist rally in Charlottesville, Virginia culminated in the death of counter-protester Heather Heyer and multiple injured victims. President Trump failed to denounce white supremacists during his first press conference on Saturday, August 12, and did not officially do so until two days later, providing white supremacists fuel for their hatred. Downtown Boys have long been discussing topics that have become more prevalent in the national conversation since Donald Trump was elected president—like sexism, immigration, and identity politics. But Ruiz notes that today, their fan base seems to be growing and paying more attention to their message. “I think people feel that our music is a lot timelier because of this administration, and so people who are looking for those moments of catharsis and looking for music in our culture that has a message can find us,” says Ruiz. This is an issue that often goes unspoken. When a band that includes members who are not only extremely vocal about issues, but who are also given a huge platform, fans and music writers often put them on a pedestal, expecting the band members to be the change they write songs about, or somehow make it happen faster. But the work can’t just fall on one person. It can’t just fall on one band. 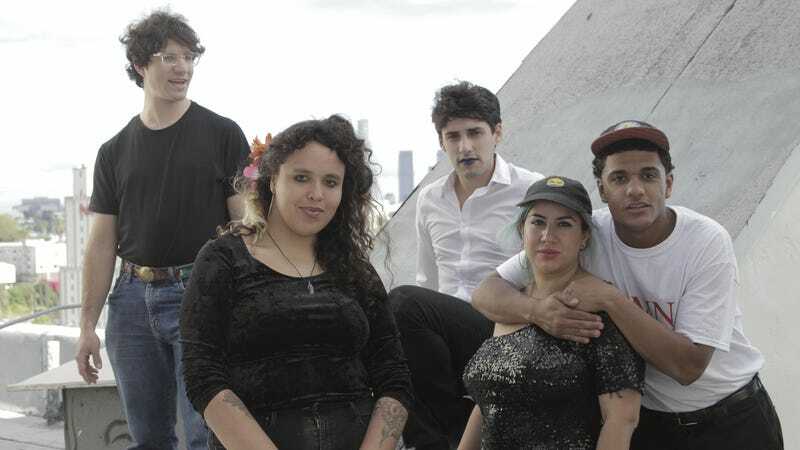 Downtown Boys expand on this idea on their song “Promissory Note,” which brings attention to how people of color after often expected to fit within a box and are rejected when they refuse to. When Ruiz and I discuss the song, I ask her what she believes is the biggest misconception tied to Downtown Boys. Part of Downtown Boys’ growing appeal is the band’s ability to put a finger to what exactly is ailing this country, to name names and call out bad actors and ignite in people a feeling of hope. But what weighs on Ruiz is the fact she knows what her fans really want, and that’s a solution. A way out of this mess. That, she seems to know, will need much more work than a few songs. Music, no matter how good it is, no matter how much it speaks to you, is always a part of something bigger. The responsibility Ruiz feels, one that probably many progressives feel too, is too heavy for just one person or group of people.”Downtown Boys is a band,” she says. “We’re musicians.” Still, one thing is certain: She and the band have gotten this far because they’ve touched on something so very real. President Trump may have awoken everyone else, but Downtown Boys were always here. They’re not going anywhere; they just hope you’ll join them in step.